Japanese representatives on board USS Missouri (BB-63) during the surrender ceremonies, September 2, 1945. Standing in front are: Foreign Minister Mamoru Shigemitsu (July 29, 1887-June 27, 1957), with cane and wearing top hat, convicted of war crimes by taking part in Unit 731, and sentenced to 7 years imprisonment. He was paroled in 1950, and again served as Foreign minister (1954-1956). In 1932, he was wounded by a Korean nationalist activist in Shanghai, China and lost his leg. He walked with an artificial leg and cane for the rest of his life. General Yoshijiro Umezu (January 4, 1882-January 8, 1949), Chief of the Imperial Japanese Army General Staff; opposed surrender in August of 1945; he believed that the military should fight on, forcing the Allies to sustain heavy losses in a ground invasion of Japan, and that only this way could Japan negotiate for better peace terms. After the war he was tried as a war criminal along with other senior Japanese officials (see International Military Tribunal for the Far East, and sentenced to life imprisonment on November 12, 1948. In middle row, left to right: Major General Yatsuji Nagai (1901-1972), Head of the Military Affairs Section of the General Staff, Imperial Japanese Army. Burned in May 1945. The youngest Japanese major general. Katsuo Okazaki (1897-1965), Foreign Ministry, part of peace delegation to the Americans on Ie Shima; Japanese minister for relations to U.S. between 1951 and 1954. Rear Admiral Tadatoshi Tomioka (1897-1970), Chief Operations Section of the Naval General Staff, Imperial Japanese Navy. Helped plan the attack on Pearl Harbor. Toshikazu Kase (1903-2004), Foreign Ministry, Head of Section 3, Intelligence Bureau. Kase said "I was the one who advocated wearing those swallow coats, not because we want to pay respect to American generals, but because we were representing our sovereign," he said, referring to Emperor Hirohito. "I had to borrow a top hat, but it was too small. It didn't matter because I had to hold it. There was a lot of wind on the deck." He served in diplomatic posts in Washington, London, Berlin and Tokyo from 1927-1960. Attended Amherst College. Lieutenant General Suichi Miyakazi (1895-1969), Chief of Section One of the General Staff, Imperial Japanese Army. 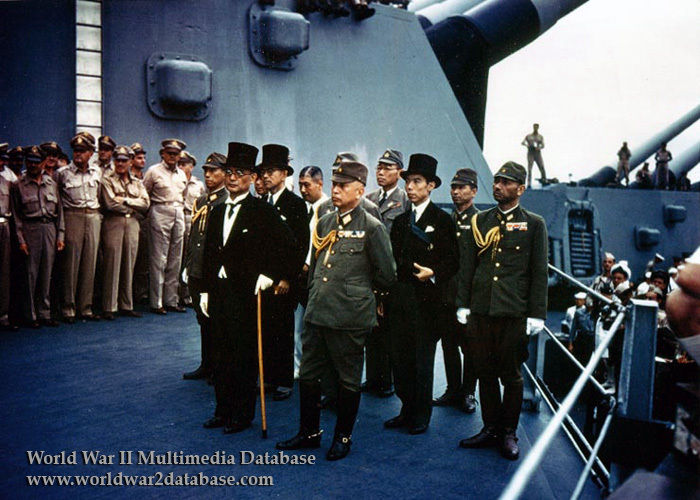 In the the back row, left to right (not all are visible): Rear Admiral Ichiro Yokoyama (born 1900), Imperial Japanese Navy; Saburo Ohta, Foreign Ministry; Captain Katsuo Shiba (1901-1970), Imperial Japanese Navy, and Colonel Kaziyi Sugita (1904-1993), War Ministry, Imperial Japanese Army.